Wow guess what we were doing in the hall? Well we were doing an Obstacle course. They did not tell use what we were doing, until we saw what was in the hall. Everyone with excitement we all sat down. I think we did it class by class. 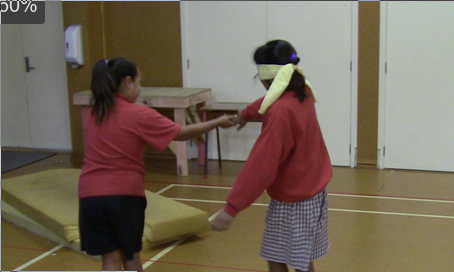 Mr Marks told use the instructions, it looked all easy but then he said that we had to do it blind fold. We were all scared because we mite fall off of some think. But luckily we get into pairs so one can tell the other one directi ons. When it was my turn I was not nervous but I was a little scared. Mr Marks put the blind fold on me, and I went along the bean,like I was walking on the plank. I walked across the ropes. When I got near the tarpaulin, when I went under it, it was like I was going into a dark cave. I walked near the stage I walked on it and I jumped of and I nearly fall of but I did not. After everyone had a turn It was time to go, I hope we could do that again. What a great story about the Obstacle Course. I really like your picture you put with your story.I like it that you have cool topic words and awesome punctuation.Oh, did you know that you have a amazing story because you have complex and simple sentences and you have different sentence beginning. I hope you are having a great time at your class. Grace I am happy that you are showing that you can write paragraphs about one main idea. Also that you are using the topic words to improve your sentences. I think you need to make sure you are reading your writing aloud when editing and that you really concentrate on your spelling. I know for a fact you know the difference between of and off!